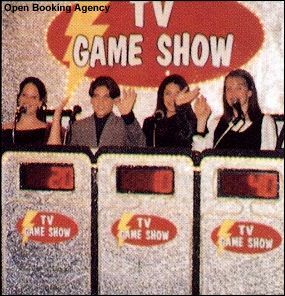 Open Booking Agency - Game Show Mania! We offer the most fun for you by combining the energy of TV game shows like "Jeopardy" adding trivia questions on many topics, and bringing 20 years of lighting, sound and of course, the best DJ's/MC's. 4 players. Custom packages to meet your needs and budget. This is a must for your next meeting or event. "Wheel of Fortune" anyone?